Pandemonium ruled Cairo's centre last week - entire streets were covered in upturned stones, large clouds of acrid tear gas hung in the air, and protesters' chants and drumbeats echoed day and night. The fighting didn't really stop until after the army was able to make use of a truce to build a wall of concrete blocks and barbed wire, to separate protesters and police. But this has not resolved the crisis. A new spark could rekindle fighting at any time. The events of recent days are more complicated than the dramatic tale we are told by television news. It is not just about valiant democracy activists versus ageing autocratic generals; not just about Tahrir Square's new Egypt against Hosni Mubarak's old Egypt - though that is part of the story. It is also about the failure of the political class and about the old regime having created lasting problems that cannot be resolved by well-meaning demonstrators. And it is about a state, which employs millions, fighting to maintain itself. "Tahrir is not Egypt," the generals argue, and they are right. As much as we may sympathise with the hundreds of thousands who descend into the streets, we cannot say they represent all of a country of 85 million. Likewise, the Supreme Council of the Armed Forces (SCAF), with its 20 or so generals, is not Egypt either. Read the rest here, where I predict the elections will move attention away from Tahrir and towards parliament. Click to enlargeI've updated my chart from a few days ago to reflect the narrowing of possible positions (from 5 to 3) and the leftward drift of most parties and personalities. At this point, of the major parties only the Muslim Brothers and al-Wafd are not officially backing the protests as far as I can tell. As always, comments, corrections and feedback appreciated. This chart does not show positions on elections — again, for now no party has called for their cancellation (although some revolutionary groups and Mohamed ElBaradei are suggesting an alternative transition plan) and the idea of postponment has only been floated. There will be a march to the Egyptian consulate in New York tomorrow to protest this week's violence in Egypt. Details after the jump. Stop Sales of Tear Gas to the Egyptian Military! End All US Military Aid to SCAF! Tear Gas Manufacturer Combined Systems, Inc. The Egyptian military (Supreme Council of the Armed Forces or SCAF) has been using tear gas manufactured in the US by Combined Systems Inc. of Jamestown, Pennsylvania, and paid for by US tax dollars, against peaceful protesters in Tahrir Square in Cairo, as well as in Alexandria, Suez and other cities. US-paid for bullets have been purposely aimed at the faces of protesters, leading to several blindings. Dozens have already been murdered in Egypt by SCAF, and at least a thousand seriously wounded. There have also been widespread reports that the tear gas being used in Egypt is of a much more toxic form, which endangers not only by possible suffocation but by life-threatening damage to vital organs. CSI-made tear gas has also been used against Palestinian protesters, including in the murder of Bassam Abu Rahma, killed when a tear gas projectile hit him in the chest, followed by the murder of his sister, Jawahar, who died by suffocation. The Occupy movement and every social movement drawing inspiration from it has been clear from the start about the debt owed to Tahrir Square. And Occupy activists are increasingly being victimized by beatings, pepper-spray and arrests (most recently at UC Davis and Baruch in New York) by politicians who show little more regard for our lives and safety than Egypt’s military. Now it is our duty to defend the Egypt revolution! End Military Rule in Egypt! Call CEO Don Smith at 724 932-2177, press 0. Via the Atlantic Council's Egypt's page, a Brookings poll carried in October showed that 43% of Egyptians believe the military was working to reverse the goals of the revolution. This suggests that the supposed silent majority that backs SCAF is much smaller than we think — just think how much those numbers must have changed in the last month alone, even before the current crisis. This suggests that the time is ripe for a major push against SCAF — and that it's been the political leaders, not the people, who have been trailing behind. The question of postponing elections is not particularly important to any actor — some are intent on holding them now, but very few have urged postponing them. We can either assume it's not a priority issue (apart from those who insist they take place) or people want them to go ahead. SCAF has conceded on transition to civilian rule by next July and the formation of a new government. The real difference is (1) between those who insist on a firm date for the transition and (2) those who want a NUG now, want a NUG after election or want a not just a new government, but the transfer of SCAF's powers to this government. I am putting this up hoping for corrections, feedback, fine-tuning, etc. Let me know in the comments. Of course this chart is impressionistic and I am aware of divergences within the Egyptian Bloc, etc. For reference on who's who, take a look at our chart of players in the elections (I've only included major coalitions and parties) and this list of Egyptian presidential candidates. Video: "People have this thing called a remote control"
A wonderful appearance on Egyptian TV by my friend Ezzedine Shukri-Fishere, in which he pulls out a remote control out of his pocket and proceeds to explain that every one has one of these in their house and can switch the channel from State TV. He then says enough with accusations of foreign hands, spies and agitation, there are tactics from the 20th century and we are in the 21st. The presenter is quite defensive. He goes in to say State TV must be the television of the Egyptian people, not that of the Interior Ministry or SCAF. Although State TV continues to be fairly bad, especially with the call-ins, I have to say it has improved tremendously even since Maspero last month. It may be partly because of rumored rebellions by its employees. And there’s still much, much room for improvement. Five human rights organizations said today that the past three days' brutal attacks on demonstrators, carried out by the Interior Ministry's security forces and military police forces under the Supreme Council of the Armed Forces in Cairo, Alexandria, Suez, Ismailiya, Assyut, and other cities, constitute criminal offences. These offences are without a statute of limitations and the perpetrators and instigators must be brought before criminal trials. The Egyptian Initiative for Personal Rights, Hisham Mubarak Law Centre, Cairo Institute for Human Rights Studies, El-Nadim Centre for the Rehabilitation of Victims of Violence, and the Arabic Network for Human Rights Information pledged to continue to identify the civilian and military officials involved in killing demonstrators, bursting their eyes and breaking their bones and skulls. These crimes have been extensively documented by these organizations and by the media over the past few days. The signatory organizations stated that the list of officials it plans to prosecute so far includes: General Mansour al-Essawi, Minister of the Interior; General Sami Sidhom, Assistant Interior Minister for the Security Sector; General Emad al-Din al-Wakil, Assistant Interior Minister for the Central Security Forces; General Hamdy Badeen, head of the military police; and General Hasan al-Ruwaini, commander of the central military district. This is in addition to other civilian and military officials in a number of other cities which have seen similar criminal offences against demonstrators. I shot this footage this afternoon, near the center of the fighting, concentrating on how the organization of medical services is taking place. One of the effects of the police's policy of shooting directly at protesters' heads in the last 3 days has been that many of them have lost an eye. Ahmad Harara, a dentist, lost one eye on January 28 and one three days ago, on November 19. Over 11,000 people were injured (and 800 killed) during the January 25th uprising, and no one, to this date, has been held responsible. It's this combination of brutality and impunity that has brought people back to the streets. And protesters are devising ways to protect themselves. Some have industrial-style goggles. Others are sharing ingenious ways to make home-made visors. Just another indication (as if one was needed) of the extraordinary resolve of Egyptians to see their revolution through. A stroll around Tahrir Square as thousands more join the protest, now in its third day. I know these videos are a little surreal. I just take the camera with me where I go, film and then edit a bit when I get back home. I put them up to capture a little of the mood. I did not go all the way to the end of Mohammed Mahmoud St. at the end of the video, when it's hard to see what's happening. I like having both of my eyes. ✪ I walked around Tahrir Square tonight. Tons more people. A bizarre mixture of a carnival atmosphere and intensity. Fighting continues down Mohammed Mahmoud St. non-stop, with new frontline protestors replacing every wounded person coming out. The slogans are simple: they are all against SCAF, for a civilian government, and against Tantawi. ✪ Since yesterday evening there has been no new raid on the Square. Yesterday’s raid was aimed at destroying the encampment — troops withdrew afterwards. It’s simply not true protestors “retook” the square, they were allowed to return. 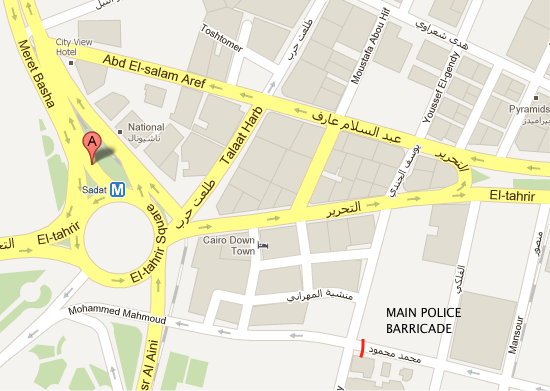 The police today is holding Mohammed Mahmoud St., which leads to the Interior Ministry. Their numbers are few and they are simply holding a line. The situation is static, because while protestors may be wearing down units, these are being rotated. It’s not like January 28 when it was a full-blown war across the city. The army can of course take the square back (with huge casualties). But they have not decided to do so yet, either because they’re afraid of what will happen, or because of pressure, or because the present situation suits them. I doubt the latter: I’m betting that they don’t know what to do. ✪ The situation in Alexandria appears to have really escalated. This is no longer just about Tahrir. The loss of Egyptian Current Party (offshoot of Muslim Brotherhood) member Bahei Eddin al-Senoussi, a major activist in Alexandria, has galvanized people there. Follow Rawya Ragei’s reporting for al-Jazeera English on this. ✪ The resignation of Essam Sharaf’s cabinet does not seem to have moved the protest movement. The SCAF is said to be negotiating its replacement with political forces, but here they must be treading carefully: if they join in a national unity cabinet, can they be assured that the protestors in Tahrir will accept? They now risk discrediting themselves in doing so. They have to be sure they can sell it to the public, and that means a hard sell. Meanwhile, the best presidential candidates (ElBaradei and Aboul Fotouh) are scathing about SCAF but offer different ways to get to a national unity government. And the most populist one, Hazem Saleh Abu Ismail, has called for more protestors to come down onto the streets. But he still wants elections, and his criticism of SCAF is partly put as a threat. ✪ The Wafd party (pro-SCAF) and the MB (critical but ambiguous) have come out in favor of going ahead with the elections. Others, like the Egyptian Liberals, are beginning to warn that elections cannot be held. ✪ Today’s announcement that members of the former ruling party will be banned from the elections may be an attempt to quell public anger. But it’s also a bit besides the point, and introduced new complications for the elections: who will be removed from the ballots (and do they have to be reprinted)? This could cause unrest of its own by people who wanted to run and who now cannot even get their relatives to do so because candidate registration has closed. It might be a big deal in the countryside. ✪ Anyone reading this site knows I thought even before the current crisis that the upcoming elections, because they were so poorly prepared, were a disaster. You can’t build a new political system on bad foundations. This is only more the case now, but elections are only worth postponing if you have a real civilian executive authority that takes over most of the SCAF’s duties. Remember the military and police are supposed to secure elections, but who trusts them now? All the major political forces have more or less concluded that a transfer of power to civilian leadership is necessary and urgent. The irony is that if the military does what some (not all) protesters want – delay the elections – it could very well spell a continued deterioration in the country’s stability. If the military does what most protesters want – fire the prime minister and appoint a new government – it could end up imperiling what little momentum Egypt’s transition has left. A new government, with a new mandate and riding a wave of optimism, may find itself tempted to postpone elections. I still don’t buy it — what stability? Admiteddly Shadi wrote his piece before the PM was fired, so we’re already down the path he described. But I still think the momentum of the transition was in the wrong direction. This might be partly because the MB thinks these elections will be good for them. The question of elections (which many protestors, unlike party members, don’t care about) has come to this: have them to hurry the current transition, or postpone them to do them properly under an entirely different transition plan where SCAF is much less powerful. The Brotherhood, in this calculus, will have to look at the big picture — as it changes by the hour. ✪ What’s up with the US making the elections taking place so central? I mean I know it’s where things have to go if SCAF doesn’t move aside (still way too early days for that). But the focus should be on the need for better political leadership and an end to violence. ✪ Speaking of the elections, here is a press release by the Carter Center on steps that should be taken to improve the electoral environment that was just released. 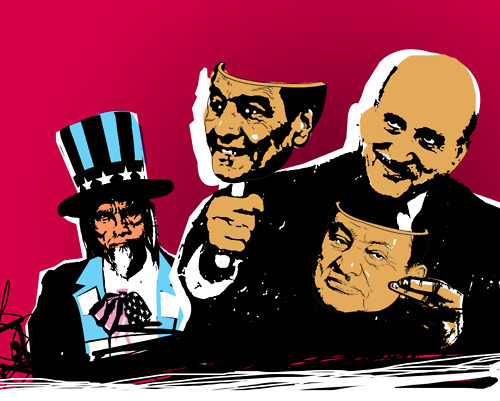 It’s funny that behind the Tantawi and Mubarak mask, he depicts Omar Suleiman, the long-serving chief of General Intelligence, Egypt’s CIA. There is increasing discussion these days of General Intelligence running the show to some extent, and perhaps engaging in deliberate destabilization. It is also widely believed that SCAF has been brainwashed by their reports on the revolution being some foreign creation. al-Destour: Will martial law be enacted in Egypt? In passing, while state TV continues to be bad, it is less bad than one might expect. I wonder if recent reports of an internal rebellion is changing things. ✪ What if turns into a general strike? A few days before the fall of Mubarak it looked that way. Labor activists believe that was crucial to the army’s decision to take over. No doubt they might be working in that direction again — as our friend Hossam el-Hamalawy is. The spasm of state violence here over the weekend marks one of two things: either an entrenchment of military dictatorship, or the long-deferred resumption of the January 25 uprising. Protestors on Mohammed Mahmoud St., just off Tahrir Square, chant against military ruler Field Marshall Mohammed Hussein Tantawi as clashes take place further down the street.